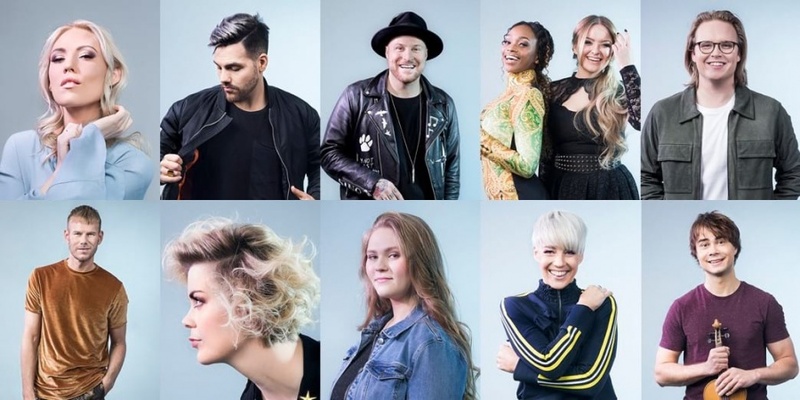 10 entries have been selected by the Norwegian broadcaster NRK for this year's Melodi Grand Prix (MGP) in Norway, out of record-breaking 1,200 songs submitted. NRK and the songwriters of the 10 songs have selected the performers. The 10 will compete in the 56th edition of Melodi Grand Prix in Oslo Spektrum on 10 March 2018. Bookmakers' predictions:Odds: Who will win Melodi Grand Prix 2018? Alejandro Fuentes – "Tengo Otra"
Aleksander Wallmann – "Talk to the Hand"
Charla K – "Stop the Music"
Stella & Alexandra – "You Got Me"
Vidar Villa – "Moren din"
Tom Hugo – "I Like I Like I Like"
Rebecca – "Who We Are"
Nicoline – "Light Me Up"
Alexander Rybak – "That’s How You Write a Song"
Listen to all the songs on nrk.no. Hosts of MGP 2018 are Kåre Magnus Bergh og Silya Nymoen. Norway 2017: Jowst - "Grab the Moment"
1985: Bobbysocks - "La Det Swinge"
1995: Secret Garden - "Nocturne"
2009: Alexander Rybak - "Fairytale"
2009 Alexander Rybak - "Fairytale" was the song that has received most points with the old voting system: 387 points – got 12 points from 16 countries. But Norway holds another Eurovision record: The country that ended last most times – 9 last places! Since the introduction of Semi-finals in 2004, Norway has been very succesful with qualification to the Grand Final 11 out of 14 times.